Happy Monday ya'll. It's almost Valentines Day and after discovering a great post contest through Pintertest Kitchen, I decided to participate in some Food Blogger Love. What is that, you may ask? Well each participant was assigned a blogger to show some love. You could make a recipe from that person's blog, or make your own recipe in their style. Either way, you were just meant to show someone else a little love this Valentines Day. I was assigned Rose Garden Lane, a fabulous new blog by Katheryn. She lives in Georgia with her husband, Lane, but is originally from Texas. She doesn't have that many recipes yet since her blog is only a couple months old, yet her photos and recipes are all so good already. It's going to be an amazing real blog, not just my silly hobby blog. Roast poblano peppers on the stove (gas stove or under broiler) until skins blister and turn black. Place peppers in a plastic bag to steam off the skins. Cut bacon into small pieces and cook in a large pot until fat is rendered. Remove bacon and set aside. Season chicken breasts with salt and pepper and brown well in the bacon fat and remove. Add onion, carrot, celery and garlic to the pan and scrape up the fond. Cook until onions begin to soften. Add potatoes, chicken breast and chicken stock to the pan and simmer until chicken is cooked through. Remove the chicken and shred with forks. Add blended soup back to pot and add in the corn and chicken. Chop remaining peppers and add those as well. Add milk and cream and thicken as needed, either with a roux or with corn starch. 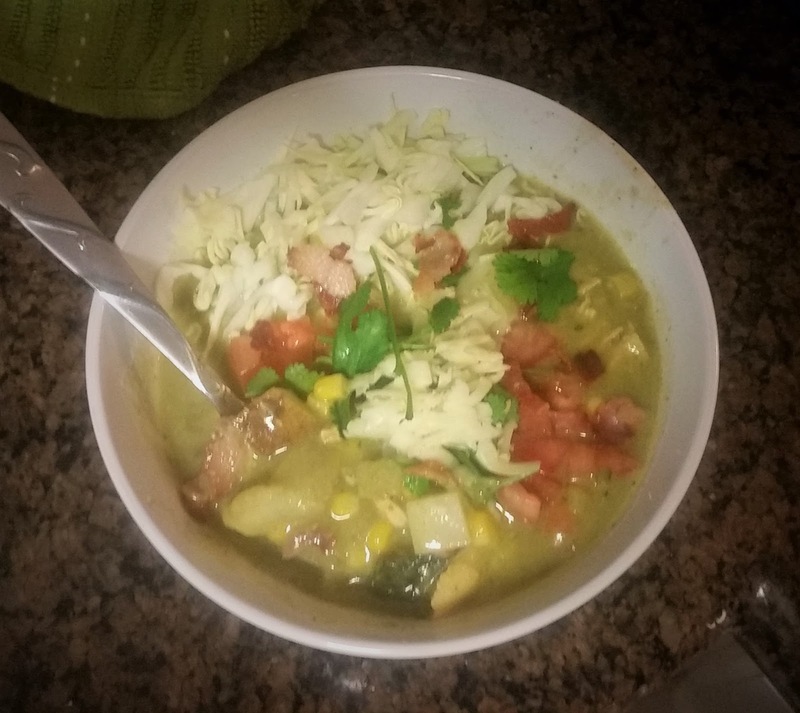 Serve soup with shredded cabbage, cilantro leaves and the crumbled bacon. 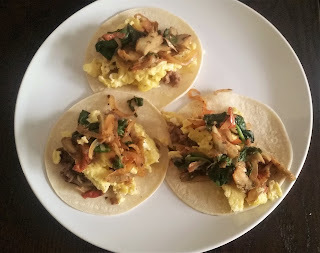 Heat tortillas until pliable and add cheese, egg, veggies and meat. Enjoy with plenty of hot sauce!